The small town of Sausset les Pins has a pretty waterfront which is abuzz at night with cafes and restaurants. The village of Sausset les Pins lies along the shores of the clear blue waters of the Blue Coast aka Cote Bleue, a fine region to spend a vacation and far from the hustle and bustle of the Cote d'Azur. The main stay industry of Sausset les Pins is fishing, namely tuna and sardine fishing, however after the fishing boats have returned to the docks, a lively night life takes over. There is an abundance of cafes and restaurants which line the waterfront, mostly opening only at night, which offer a variety of cuisines from traditional Provencal French to Asian. Marina in the village of Sausset Les Pins at sunset in the Cote Bleue, Blue Coast, Provence, France, Europe. 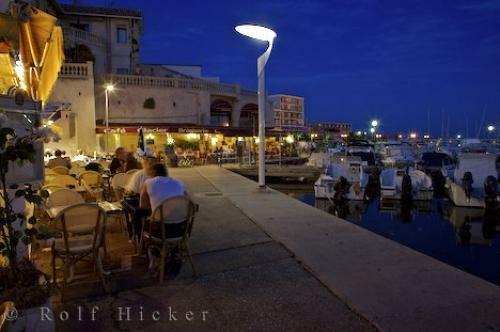 Photo of waterfront cafes in the village of Sausset Les Pins at night, Blue Coast, Provence, France.